Dogs have a long-standing history of providing faithful companionship. 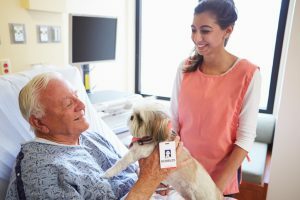 These loyal animals are one of the best sources of comfort for any human – including hospice patients and their families. Hospice dogs offer the comforting power of physical contact, says Samaritan Volunteer Barb Ogle, who adopted Hank three years ago. “The warmth of touch is so important. It improves moods and reduces anxiety,” she explains. 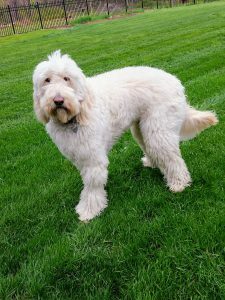 Hospice therapy dogs have stable temperaments and friendly, easy-going personalities. “Your therapy dog has to be up to lots of hugs,” notes Joan Byrne, a long-time pet therapy volunteer. Such unconditional love is important for patients’ well-being. These furry visitors act as a non-judgmental listener or a quiet friend. They sit calmly and let patients and their families recollect and smile. The use of pets in medical settings dates back more than 150 years. Florence Nightingale, a founder of modern nursing in the 19th century, recognized animals provided emotional support. Studies show petting dogs and cats can reduce blood pressure and anxiety. This simple act prompts the release of “feel good” hormones in humans, including serotonin, prolactin, and oxytocin. Mia had owned dogs her whole life until two years ago when Jonsie, her beloved 14-year-old beagle, passed away. Now 81, she lives at a local assisted living center and misses the companionship of owning a four-legged friend. Mia’s lung disease causes her to wheeze and become short of breath. She reached out for hospice care services three weeks ago, and soon after met Hank. Certified by the Alliance of Therapy Dogs, Hank patiently sits beside Mia so she can gently pet him. As Mia caresses his pink nose or rubs behind his fluffy ears, he places his paw or head on her lap for extra love. Mia relishes his affection and gives the friendly pooch a hearty neck scratch. She feels comforted by his presence. What Other Complementary Therapies are Available with Hospice Care? Experts agree that pets excel as healing assistants. Meeting with a hospice pet-therapy dog provides a long list of mental health benefits. The canine encounters bring joy and reduce feelings of isolation, alienation, anxiety and depression. They help take a patient’s mind off their aches and pains and encourage communication – including sharing stories and emotions. Such visits can break the daily routine, increase overall emotional wellness, and stimulate the mind in dramatic ways. 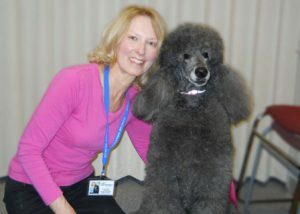 Brooke, Joan’s standard poodle certified by Bright & Beautiful Therapy Dogs, Inc., visits with patients and families anywhere from a couple minutes to a half-hour or more. “I let the family give me cues as to what they want out of the visit, and Brooke and I adjust accordingly,” she explains. Some patients need their spirits lifted with a little pleasure and laughter; others need quiet comforting. “Even if we’ve met before, each encounter is a new experience,” says Joan. Recently, Barb’s dog Hank played “dress up” with Betty*, a 72-year-old with a love for fancy scarves. After softly petting Hank’s calm head, Betty’s eyes lit up with an idea. Hank would look good in one of her blue floral scarves! Hank sat happily, still as a statue, as Betty wrapped the fabric slowly around his neck. She giggled more than she has in months. Hank enjoyed pleasing Betty. And Betty would always remember the day she dressed the golden doodle up in her scarf. This therapy dog’s visit clearly brightened Betty’s day. She had been feeling down about her cancer diagnosis, but Hank helped take her mind off her problems, even if just briefly. Hospice pet therapy visits provide comfort on many levels. Sara*, a young patient with MS, couldn’t communicate verbally. But, a sweet head on the edge of her bed was always appreciated. Sara would smile broadly and relax when Brooke would visit. Tossing a ball or toy for the animal to fetch. Silently enjoying the dog’s presence. Talking to, petting, hugging, holding, or cuddling with the animal. Enjoying the dog’s playful response to commands such as sitting, rolling over, or shaking hands. 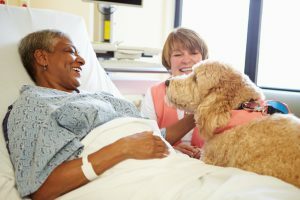 Encounters with these special dogs encourage conversation and emotional connection between patients and their families. Joan recalls one visit after a hospice patient had passed away. The family sat with Joan and her gentle poodle talking about the patriarch of their family – a beloved dad and grandfather. They spoke about how much joy he – and the entire family – felt during each of Brooke’s visits. Another time, Joan was asked to bring Brooke to sit vigil with Mary* as her mother was passing away. Joan, Brooke, and Mary sat quietly together. Mary stroked Brooke’s soft fur and felt the unconditional love of the big, dark-eyed pup. They experienced a quiet, emotional connection when Mary needed it most. 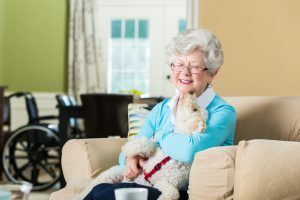 Whether a hospice therapy dog visit aids in reminiscing, eases loneliness, or calms anxiety, the benefits of visits with hospice patients and their families are numerous. Not only can visits influence health, but visits also influence happiness. The opportunity to facilitate these moments for patients at the end of life, and their family members, is priceless. *Names of patients are changed to protect privacy.